Ever have those nights where you really don’t think dinner will get done? This is the dish for those nights! Its quick, easy, and full of flavor. In one pan you will enjoy both your protein and your vegetables which are dressed with an Asian style sauce that is to die for! 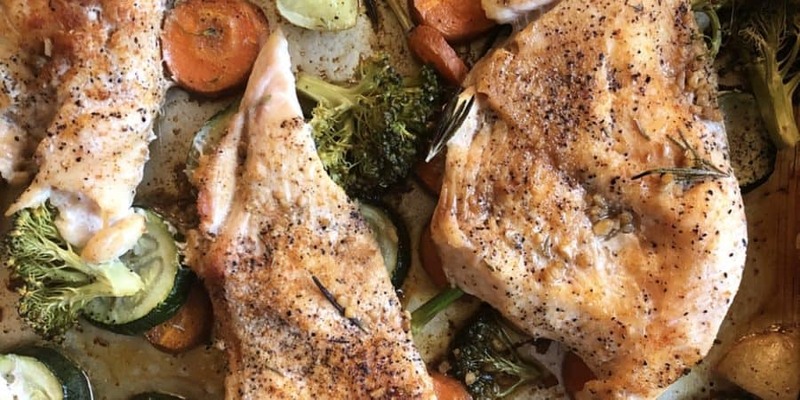 Having everything in one pan is super convenient, less of a hassle and less clean up which is always a bonus. I always try to incorporate as many vegetables as I can into our meals and this dish is perfect for that! Nothing is better that roasted veggies topped with a glaze for extra flavor. Season the chicken with the paprika, garlic powder, ground ginger, thyme and rosemary. Salt & pepper the chicken and veggies. 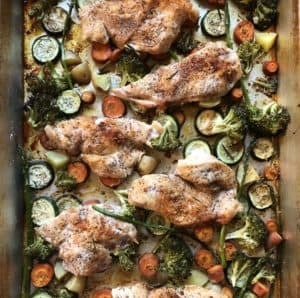 Spray baking pan sheet with olive oil and add the vegetables. Salt & pepper the veggies and spray with some olive oil. Cushion the seasoned chicken into the pan around the veggies. Pour the sauce all over the veggies and chicken. Bake in the oven for 30 minutes till cooked through and lightly browned. Enjoy as is or with some rice!